Launch Date: February 26, 2017 on Amazon! Paperback will be released in summer 2017. Interested in visiting Atlantic Canada but haven't quite gotten there, yet? Or, are you thinking of going on your first solo adventure? 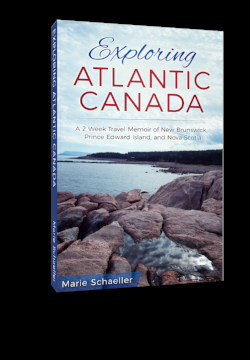 Exploring Atlantic Canada was inspired by a solo trip the author took to drive around the Canadian Eastern Maritimes, experiencing the stunning natural beauty, vibrant music scene, delicious food, and rich local history. In this book, you will learn how to prepare and plan for your own trip, as well as the people and places the author experienced along the way. Included are helpful links, tips, photographs, and maps; in the hopes of inspiring your own trip to Nova Scotia, Prince Edward Island, and New Brunswick.